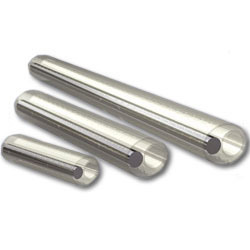 Standard Splice Protection Sleeves : Cut lengths are pre-size and burr free and recovered diameter is 3 mm. The entire assembly is heat bonded to ensure that the tube maintains perfect alignment. The product is constructed with an inner melt EVA adhesive tube and polyolefin Heat Shrinkable Sleeves as outer Jacketing tube with mirror finish SS as strength member. Complete facility to develop sleeves with variety of diameters and lengths as per customer requirements. This premium product comes without premium pricing. Our prices are amongst lowest in the world for similar quality product. *Shrink times will vary with manufacturer of the heater used and the ambient temperature.